NEW YORK — An iconic oil painting by British artist David Hockney estimated to be worth $80 million is going on sale in New York, poised to set an auction record for the most expensive work by a living artist. Portrait of an Artist (Pool with two figures) will go under the hammer in November, expected to break the record held by American Jeff Koons’s US$58.4 million Balloon Dog (Orange), set in 2013, Christie’s said. Alex Rotter, co-chairman of post-war and contemporary art at the auction house, called the Hockney "one of the great masterpieces of the modern era." 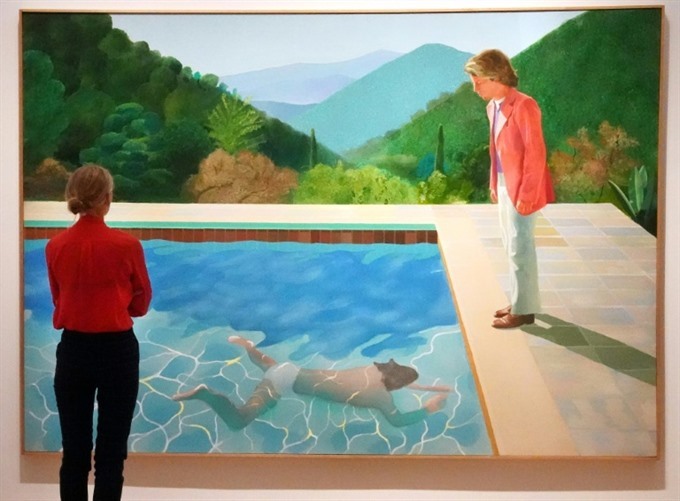 The painting represents the "apex" of the British pop artist’s two most celebrated motifs, Rotter explained, the glistening water of a swimming pool and the double portrait with two people interacting. In the picture, a smartly dressed man, standing on the edge of the pool, looks pensively at another figure swimming toward him, with an idyllic mountain view in the background. The first man depicts Hockney’s former lover and muse, Peter Schlesinger, who was one of his students at the University of California, Los Angeles. The picture dates back to 1972, the year that their great love affair ended, and the swimmer could be Peter’s new lover, Rotter said. One of Hockney’s most celebrated works, it has featured on the cover of a number of monographs about the artist and was part of an international retrospective devoted to Hockey to celebrate his 80th birthday in 2017. "From the Tate (in London) to the Centre Pompidou (in Paris) to the Metropolitan Museum (in New York), this painting was always a stand-out, a painting that everybody gravitated to," said Rotter. While Christie’s declined to reveal the identity of the seller, Bloomberg and the Artnet website reported that it was owned by British billionaire Joe Lewis, who owns the Tavistock Group, London Premier League soccer team Tottenham Hotspur, and whom Forbes estimates to be worth $5 billion. Christie’s, which in 2017 set the record for the most expensive work of art known to have been sold with Leonardo de Vinci’s Salvator Mundi at $450 million, said there had been a battle to secure the right to sell the picture. "We have been for years dreaming about having this and pursuing it. Obviously it was competitive ... The Salvator Mundi certainly did not hurt," Rotter said.